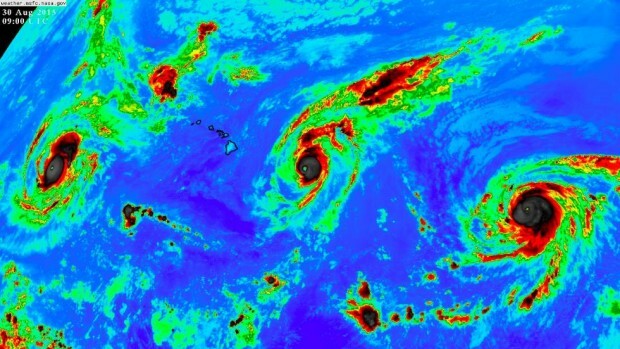 Three hurricanes have never simultaneously appeared in the same ocean before—until this past weekend when three Category 4 hurricanes hovered on approach to Hawaii. 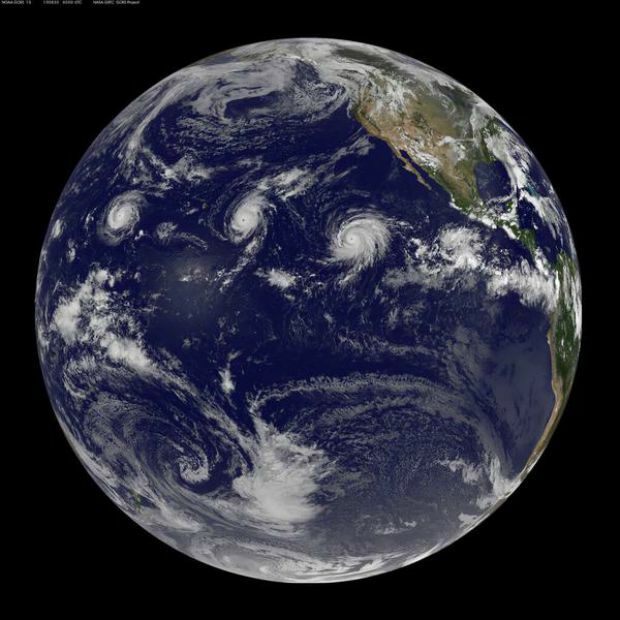 Hurricane Kilo was clocked at 135 mph, while Hurricanes Ignacio and Jimena have reached speeds of 140 mph. Category 4 is the second highest status used to measure hurricanes, also called typhoons once they enter the Western Pacific Ocean. These three hurricanes will continue to create stormy weather for Hawaii, and depending on how they strengthen and what paths they take, any or all could threaten Japan, Taiwan and the Philippines. In fact, Dr. Phil Klotzbach of Colorado State University said the central Pacific basin is seeing a record hurricane season. A big reason for this, according to the National Oceanic and Atmospheric Administration, is the exceptionally strong El Niño weather pattern taking place this year. The strength of that same weather pattern is expected to bring a particularly fierce winter to the Northern U.S. as well. What is El Niño? Its cycles are not fully understood, but every two to seven years, the central and eastern Pacific Ocean warms for anywhere from 6–18 months. To quote News Australia, “The Australian Bureau of Meteorology says the eastern half of the northern Pacific was now more than one degree warmer than the averages – with patches more than two degrees higher.” That’s Celsius of course, converting to a 1.8–3.6 degree increase in Fahrenheit. This is also a reason the Atlantic Ocean is seeing a relatively calm hurricane season, since El Niño tends to demonstrate an inverse effect on the Atlantic Ocean. A colder Caribbean Sea creates greater vertical wind shear with which storms come into contact over a larger area. Greater wind shear acts like a wall that slows the air currents that help develop and sustain hurricanes. Think of it like a runaway truck ramp on the side of the highway: the longer the strip of gravel, the more that truck will be slowed before it hits something. It holds true for hurricanes, too. That wind shear is focused between hurricanes and land, and the greater an area it takes up, the more the hurricane is slowed before it strikes someplace populated. 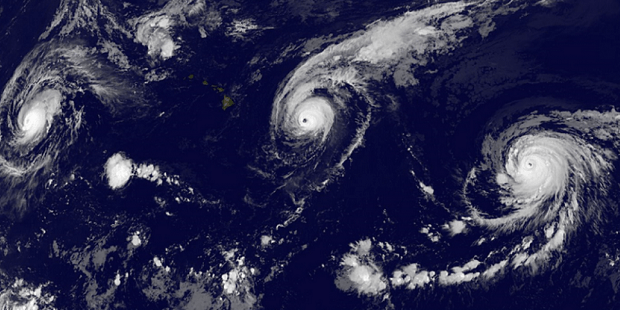 The low wind shear in the Pacific during El Niño years gives hurricanes little resistance as they form and move. Yet these hurricanes aren’t alone in the kinds of unprecedented weather events that scientists have been recently observing. As climate change continues to make sea levels rise, more water evaporates into the atmosphere. This water is introduced into storm cycles, creating more severe weather. The National Wildlife Federation estimates that hurricanes will become stronger as the earth warms. Worldwide, they estimate an increase in average hurricane wind speed between 2–11 percent (enough to make many Category 3 storms into Category 4 storms) and an increase in average rainfall between 3–31 percent. Imagine the irrevocable damage Hurricane Katrina would have caused with a third more rainfall. These warming conditions further exacerbate the effects of El Niño, which is expected to exceed the peaks reached in 2002 and 2009. The Northern Pacific is experiencing its warmest conditions in more than 65 years of recording. What do you think the increased storm weather says about the state of climate change? Are we ready to face an era of global superstorms?